The idea of change management came to prominence in the 1980’s and 1990’s when the large consulting firms leveraged it as a way to make sure that technology innovations were adopted by clients in the most effective way possible. Change management software was inevitability developed to bring structure to the process. Perhaps because of its origins, change management software is often thought of by business leaders as necessary only for organizations undergoing massive systemic change or for the management of complex multi-stage projects. While it is useful in both scenarios, it has also been implemented by organizations that simply want to capitalize on a wide variety of opportunities for improvement, some small, some large. In doing so, leaders have uncovered some surprising benefits beyond successful project completion. Here are a few. The word perspective has several definitions including, “a particular attitude toward or way of regarding something; a point of view.” It is natural for individuals at various levels of an organization to have different perspectives regarding almost every aspect of business. Problems that look insignificant from the C-suite may represent real pain to front-line workers or clients. Change management software is designed to gather ideas, input and energy from all levels of an organization and consider each opportunity for improvement from the perspective of those closest to the problem and most invested in positive change. Surprisingly impactful and easy-to-implement ideas are often uncovered for immediate, tangible improvement. “The way we have always done things,” is a powerful foe to those who would encourage positive change. 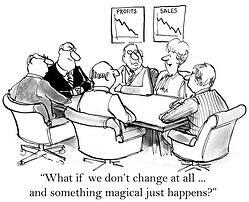 Change is uncomfortable and human nature resists it. That’s why it often seems like new policies and approaches simply don’t stick. Change management software helps in several ways. First, it brings structure to change so risk is reduced. People are more comfortable with change when they can see a clear path to a positive outcome. It also helps by underscoring management’s commitment to change. The investment in a solution to bring order to the process lends credibility to leader’s claims that transformation is required. Sure, nothing sounds less emotional than change management software, but the simple act of engaging employees in the effort to identify opportunities for improvement can result in a passionate commitment that is rarely achieved with top-down edicts. When people act on ideas that they care about, they are better able to overcome obstacles and find novel ways of getting results. Organizational change often requires cross-department cooperation and teamwork. By structuring transformation with change management software helps instill a culture of collaboration. Staff members who may not regularly cross paths have the opportunity build relationships that last beyond the immediate project and strengthen the organization as a whole. Leaders who implement change management software frequently get more than they bargained for, in a good way. It is a worthwhile consideration for companies that are undergoing complete transformations as well as those that want to develop a process for incremental improvement.